I think I have solved a small puzzle in socialist history. Climate & Capitalism‘s tagline, “Ecosocialism or barbarism: There is no third way,” is based on the slogan, “Socialism or Barbarism,” which Rosa Luxemburg raised to such great effect during World War I and the subsequent German revolution, and which has been adopted by many socialists since then. Luxemburg first raised the idea that humanity faced a choice between the victory of socialism and the end of civilization in a powerful antiwar pamphlet she wrote in prison in 1915. The Crisis in German Social Democracy — better known as The Junius Pamphlet, after the pen name she used to avoid prosecution — played a key role in educating and organizing a revolutionary left opposition to the pro-war leadership of the German Social Democratic Party. Friedrich Engels once said: “Bourgeois society stands at the crossroads, either transition to socialism or regression into barbarism.” . . . Until now, we have all probably read and repeated these words thoughtlessly, without suspecting their fearsome seriousness. . . . Today, we face the choice exactly as Friedrich Engels foresaw it a generation ago: either the triumph of imperialism and the collapse of all civilization as in ancient Rome, depopulation, desolation, degeneration — a great cemetery. Or the victory of socialism, that means the conscious active struggle of the international proletariat against imperialism and its method of war. With that in mind, let’s look at the suggestions three scholars have made for passages that Luxemburg might have had in mind when she attributed the sentence “Bourgeois society stands at the crossroads, either transition to socialism or regression into barbarism” to Engels. Although that passage expresses a related idea, there are three serious objections to it as Luxemburg’s source. First, her wording is so different from the Manifesto‘s that it’s hard to imagine her getting it so wrong, even quoting from memory. Second, it’s unlikely that she would attribute a passage from Marx & Engels’ best-known collaboration to Engels alone. And third, the standard English translation I’ve quoted above, which Hudis and Anderson also use, omits three important words that appear after “as Friedrich Engels foresaw it a generation ago” in the original German: vor vierzig Jahren. Surely no one writing in 1915 would refer to 1848, when the Manifesto was published, as forty years ago. Forty years would go back to the mid-1870s, which directs our attention to Anti-Dühring, which Engels published in serial form in 1877-78, and as a book in 1879. Since it was the most comprehensive statement of the Marxist worldview written by either of the movement’s founders, it’s a reasonable place to look for quotes similar to the one Luxemburg attributed to Engels — and two scholars have done just that. [B]oth the productive forces created by the modern capitalist mode of production and the system of distribution of goods established by it have come into crying contradiction with that mode of production itself, and in fact to such a degree that, if the whole of modern society is not to perish, a revolution in the mode of production and distribution must take place. In fact, it is Rosa Luxemburg who invented, in the strong sense of the word, the expression “socialism or barbarism,” which was to have such a great impact in the course of the twentieth century. If she refers to Engels, it is perhaps to try to give more legitimacy to a fairly heterodox thesis. The author of the sentence Luxemburg quotes, and of the “socialism or barbarism” concept more generally, was not Engels, but the man who was widely viewed as the most authoritative Marxist theoretician after Marx and Engels — Karl Kautsky. The program itself was deliberately brief — just over 1,300 words in English translation — with little in the way of explanation or argument, so Kautsky then wrote a book-length popular commentary on it, explaining the program and arguing the case for socialism. 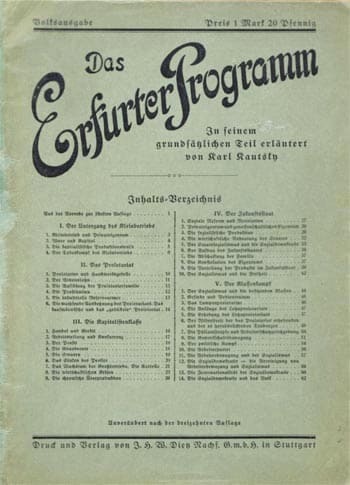 Das Erfurter Programm in seinem grundsätzlichen Teil erläutert (The Erfurt Program: A Discussion of Fundamentals) was published in 1892. Historian Donald Sassoon writes that the program “became one of the most widely read texts of socialist activists throughout Europe” and Kautsky’s commentary “was translated into sixteen languages before 1914 and became the accepted popular summa of Marxism” around the world. If indeed the socialist commonwealth were an impossibility, then mankind would be cut off from all further economic development. In that event modern society would decay, as did the Roman empire nearly two thousand years ago, and finally relapse into barbarism. If I’m correct, then Michael Löwy is wrong to suggest that Luxemburg “invented, in the strong sense of the word, the expression ‘socialism or barbarism. '” Rather, she wrote “we have all probably read and repeated these words” because that was the simple truth — as a result of Kautsky’s widely-read book, the idea that humanity must move forward into socialism or fall back to barbarism was already well-known among socialists in Germany. Ian Angus. “The Spectre of 21st Century Barbarism.” Climate & Capitalism, August 20, 2012. Rosa Luxemburg’s The Junius Pamphlet — The Crisis in German Social Democracy is posted in the Marxist Internet Archive in English and German, and is available in many printed anthologies. Every English version that I’ve seen includes the errors and omissions described above. Norman Geras. The Legacy of Rosa Luxemburg. NLB Books, 1976, and Verso Books, 1983. Michael Löwy. “The Spark Ignites in the Action — the Philosophy of Praxis in the Thought of Rosa Luxemburg.” International Viewpoint, May 2011. Ian Angus is editor of the ecosocialist journal Climate & Capitalism. This article was first published in John Riddell’s Marxist Essays and Commentary.